Recently I ran across some bugs in Civil cross sections, and we learned a few things. While studying (using Dana’s and James’ book) I was reminded about a some of these items, and thought I’d mention one. When generating volume reports from cross section data, the only data available for analysis is the data sampled in the Sample Lines. 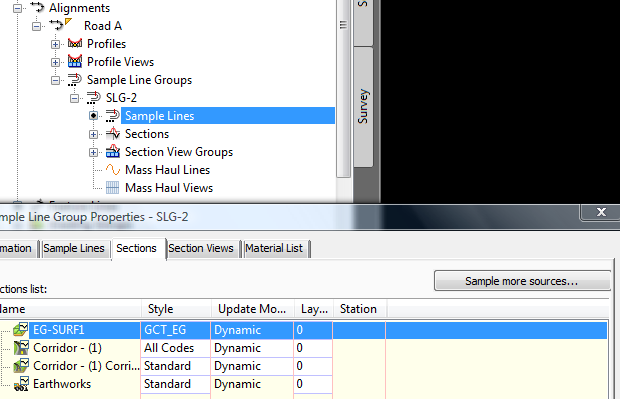 If you are missing a surface you need to analyze (like the corridor surface), make sure you add it to the Sample Lines set. Whether it is because you need to add data for analysis, or because you erased cross section views, and suddenly your data is missing from the new Views, this button is the key.